The popularity of the 50 States Quarters failed to make much of an impression on Mint Sets sales in 1999, partly because of a hefty increase in the price of the sets. Collectors simply did not want to spend an extra $6.95 for four more Quarter designs. However, this set will be key for years to come, because it is the first year of the State Quarters. 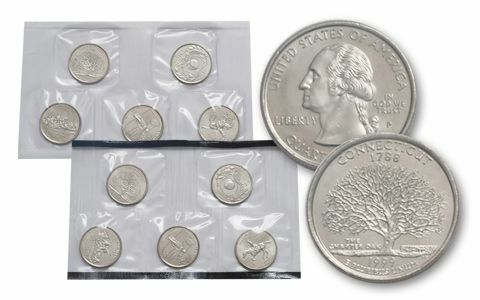 About the sets: The coins in the 1999-PD Mint Sets were Uncirculated pieces pulled from regular production runs, thus the quality of the individual coins varies widely from set to set, and even within a set. Beware: the full 1999-PD Mint Sets contain 18 coins. Because the P- and D-Mint coins were packaged separately, they are sometimes sold separately. While it may seem obvious that each envelope is only half of the set, many new collectors have purchased single envelopes at the retail price for a full set! In 1999, the Mint also sold a special 2-piece set of Uncirculated Susan B. Anthony Dollars from the Philadelphia and Denver Mints. 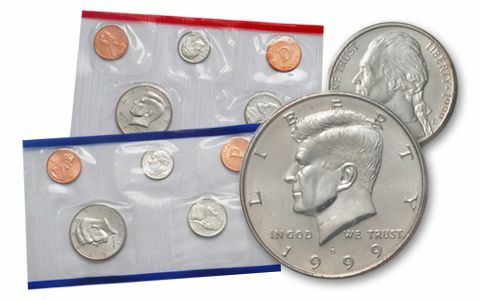 The P-Mint Dollar and token were sealed in a pliofilm pack with blue edging. 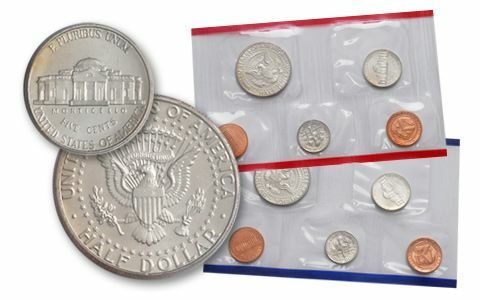 The D-Mint Dollar and token were sealed in a pliofilm pack with red edging. Both packs were placed in a blue envelope with an image of the revived Susan B. Anthony Dollar. One example of each of the following Quarters from the Philadelphia and Denver Mints: Delaware Quarter (Copper-Nickel Clad), Pennsylvania Quarter (Copper-Nickel Clad), New Jersey Quarter (Copper-Nickel Clad), Georgia Quarter (Copper-Nickel Clad), and Connecticut Quarter (Copper-Nickel Clad). Original packaging: The 1999-PD Mint Set consisted of two different sets, one containing the Philadelphia Mint coins, plus a Cent-sized token with a large "P" (for Philadelphia). 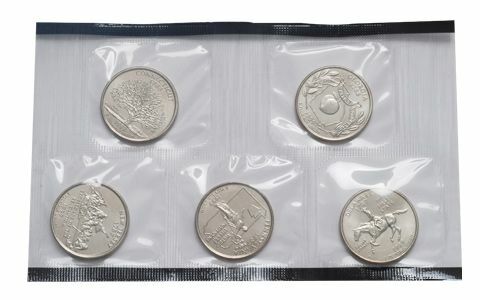 The P-Mint 50 States Quarters were housed in their own, separate pack. 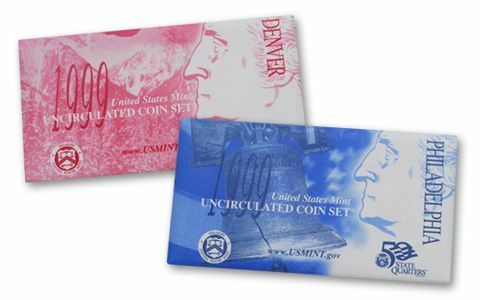 The second set contained coins from the Denver Mint, plus a token with a large letter "D." The D-Mint 50 States Quarters were also housed in their own, separate pack. The pack containing the D-Mint coins was edged in red, while the pack containing the D-Mint Quarters was edged in black. The pack containing the P-Mint coins was edged in blue, and the pack containing the P-Mint Quarters was edged in white. The two P-Mint packs were placed in a blue envelope; the D-Mint packs in a red envelope - both with images of George Washington. America prepared for the Y2K computer bug. President Clinton was acquitted in an impeachment trial in the U.S. Senate. Nicole Johnson of Virginia won the Miss America contest. The Panama Canal was returned to Panama. The Euro became the new currency of the European Union. Gen. Pervez Musharraf seized control of the government of Pakistan. NATO began airstrikes on Belgrade after war erupted in Kosovo.